The Glenna Jean Rhythm collection features bold prints paired with cool greys and crisp whites to create an inviting, modern nursery. 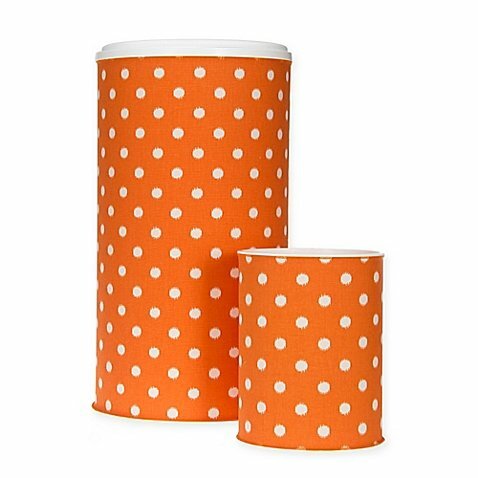 This coordinating Hamper and Wastebasket Set features fun ikat white dot on orange for style as well as organization. Includes: Hamper measuring 13" diameter x 23.5" H Wastebasket measuring 8.5" diameter x 11" H Velcro® closure on fabric covers. 60% cotton/40% polyester. Machine wash. If you have any questions about this product by Glenna Jean, contact us by completing and submitting the form below. If you are looking for a specif part number, please include it with your message. SKEMiDEX---Cherry Infant Baby Changing Table w/3 Basket Hamper Diaper Storage Nursery New This Baby Changing Table keeps everything tidy and concealed for a clean look in the nursery.